I made this macaroni and cheese recipe. Very nice, but when I made it the second time I left out the agar powder. halved the nuts and used a bit more okara. 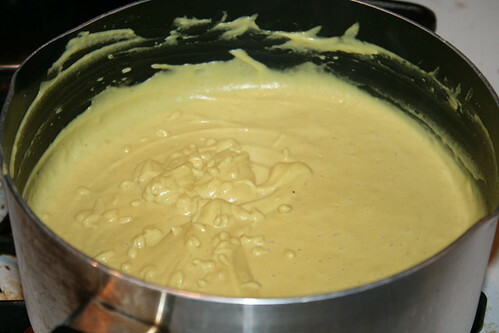 result was a smoother "cheese" sauce. I have also used the sauce in cooking a mushroom sauce, with delicious results. Thanks for sharing your modifications! I experimented a lot with thickeners and found that the agar powder worked best for my tastes -- but I'm glad you figured out an agar-free version, as that ingredient is sometimes difficult for people to find. There is only one store in my town that carries it. Wow, really great recipes here! 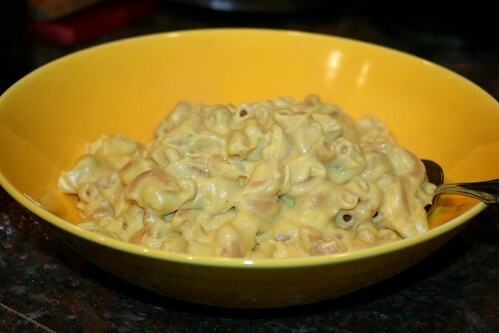 I've made many vegan mac n cheese sauces but have never come across one that uses the combination you used (usually just flour or cashews with seasonings or pachaged vegan cheese). My son loves vegan mac n cheese. I've gotta make this one! A friend have just given me a soymilk machine and tonight I made the first batch! So thankful to have found your blog and so happy that you're vegan! I've made your mac and cheese recipe a few times (yes, it's a repeater!) and I just wanted to share one of my adaptations: Korean "cheese" fondue! I leave out the agar and corn starch and instead add yams. I cook these in the unsweetened soy milk, add all your ingredients and also add 1.5 tablespoons of gochujang (Korean hot sauce). I eat it with potatoes, carrots, baby corn, pak choi, Irish soda bread, etc. Mmmm!! Thank you for the original recipe, it was a great inspiration! Lisa, that sounds amazing! I LOVE Korean food and just bought a huge new container of gochujang just waiting to be used up. I make my own kimchi, so I might also have to try making this recipe as-is, then adding chopped kimchi to it. Cheese and kimchi is such a delicious combo!